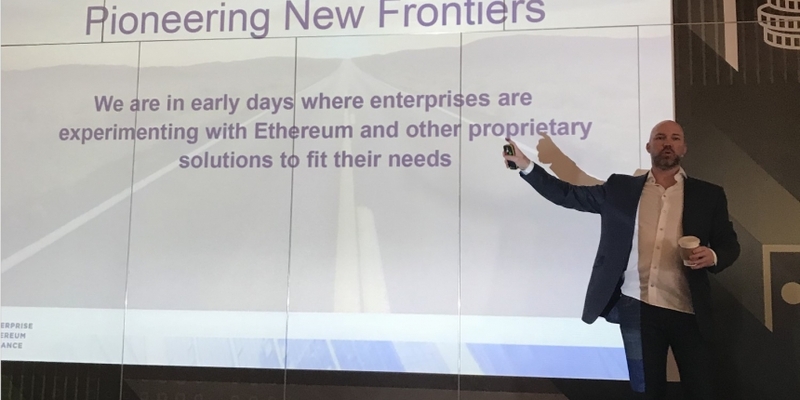 The Enterprise Ethereum Alliance (EEA) intends to release a set of common blockchain standards for businesses in 2018, one of the consortium’s leading members said Thursday. Onstage at Blockchain Expo in London, Jeremy Millar, a founding board member of the 450-member group, which boasts Accenture, JP Morgan and UBS among its ranks, provided the update as part of a talk that sought to give an overview of the general progress made by the consortium since it was first founded in 2017. In his talk, Millar began by stressing to the audience the importance of setting common standards when it comes to technology adoption. Millar went on to cite the addition of former WiMAX Forum president Ron Resnick as EEA executive director as a hire that would bolster the consortium, which now has 15 employees looking at architecture and technical specifications. Elsewhere, he said the group has seen progress on setting standards and specs relating to “oracles,” or smart contracts meant to feed external data into blockchain systems. Faisal Khan, of EEA member firm ConsenSys, would later pen a sarcastic Medium post that sought to highlight the benefits of its approach, which it has long argued is more aligned with the open-source developer movement that has sprung up around ethereum, the world’s second largest public blockchain by total value. In this way, Millar added that it’s likely some EEA features will be taken back into the code for the public ethereum blockchain in the form of ethereum improvement proposals (EIPs). “Next phase will be a testnet. And once we start seeing code coming out, we need certification,” said Millar. Correction: An earlier version of this article misattributed Faisal Khan’s blog post to the EEA.